In most the grocery stores you probably won’t find carrots with their tops attached. It’s a shame because, carrot greens — also known as “fronds” — aren’t just a decoration on top of Bugs Bunny’s favorite snack. These feathery green leaves are a table-worthy food. 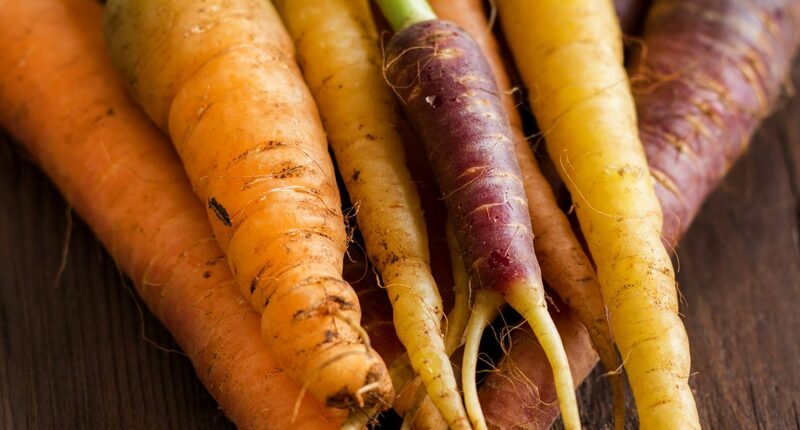 But if you’ve grown your own, if you are shopping at the farmers’ market or you are in a more forward-thinking store, you’ll find carrots with their spicy other half still attached. Don’t leave the tops behind. All that flavor. All that food. Enjoy these tips for eating up your carrot fronds. Carrot tops have a peppery flavor, similar to arugula or parsley and can bring that same sort of spice to a range of dishes. When cooking with them, remove the fibrous stems, as you would any other tender herb such as parsley or dill. When you are shopping for carrots, look for those that have bright, fluffy fronds. Avoid bunches that have wilted or slimy fronds. Those tops will lack the flavor and texture you want and are a sure sign that the roots aren’t as fresh as they could be. Argentines wouldn’t dream of cutting into a juicy steak without a healthy spoonful of herbal, tangy chimichurri on their plate. The oil-based sauce, full of parsley and spiked with pepper flakes, is also sluiced on a baguette stuffed with grilled sausage for the country’s famed “Choripan,” a popular street snack. Carrot tops, with their verdant and spicy flavor are right at home blended into this traditional condiment. Pesto, the popular Italian herb spread-slash-sauce, brings its bright, basil-filled flavor to pasta, sandwiches, panini and more. Try substituting some of the basil leaves normally called for with carrot greens, as in this recipe for roasted carrots. The fronds will bring a bit of a spicy note to the pesto but nothing that the fatty and delicious cheese and nuts won’t mellow. Carrot tops add a slightly astringent, fresh flavor to stocks that liven them up just as would a few springs of parsley. You can also build a soup around them as does the clever Deborah Madison, cookbook author and genius of vegetarian cuisine, demonstrates in her recipe for carrot top soup. A few finely minced carrot greens mix nicely in salads of any variety. They are particularly good in salads that feature soft butter lettuces where their bitter edge adds a fine contrast. Add just a few and they will bring a bit of palate cleansing fire that wakes up your taste buds — just as a few chili flakes on a slice of pizza or sprinkled over a bowl of pasta add a surprising but welcome singe to the random bite. You can also feature them heavily in salads, such as panzanella, fattoush or tabbouleh, substituting them in whole or in part for the parsley listed. “What grows together, goes together,” is a commonly used mantra in the farmers’ market for creating interesting pairings. Foods that share the season are usually comfy companions on the plate. Summer corn and tomatoes, early fall squashes and chilies, spring peas and mint are a few examples. You can apply the same philosophy to all parts of a plant. What can you use the fronds for? Any recipe that takes advantage of the roots. The warm, mellow flavor of carrot root and the lively flavor of its leaves make for the perfect counterpoint. The next time you roast some carrots, sprinkle some minced fronds on top of them just as they come out of the oven. Even better, puree some fronds with a little oil and drizzle over the sweet, roasted roots. A pureed carrot soup is soul soothing on a chilly day. Top each bowl with a few streaks of the same carrot frond oil before serving for a visual contrast and a taste boost that feels deeply healthful. Carrot salsa might sound unusual but take a visit to a taco bar and the you’ll spot the inspiration for this spicy condiment. A fiery trio of pickled carrots, jalapenos and onions is a popular addition to the line-up of taco toppers on offer. Roasting the carrots and onions brings out their sweetness — a perfect counterpart to pungent vinegar. And the addition of carrot tops not only reduces food waste, it’s a great, green alternative for cilantro naysayers. On a large cookie sheet or half sheet pan, toss the carrots, onion and garlic with the oil, a generous sprinkle of salt and pepper and the cumin. Roast until tender, about 30-40 minutes. Set aside to cool. In a medium bowl, combine the jalapeno, vinegar and sugar and stir to dissolve the sugar. When cool enough to handle, peel and mash the garlic clove and stir into the vinegar mixture. Finely dice the carrots and onion and add to the mixture as well. Alternatively, you can finely dice the carrots, onion and garlic in a food processor, being careful not to over-process to a paste, and add to the vinegar. Serve immediately or cover and refrigerate for up to five days.